1. I’m willing to mix ingredients that have never been mixed before. 2. I am not that picky. Follow a lasagna recipe. Substitute salsa for all or part of the tomato sauce. It’s that easy! 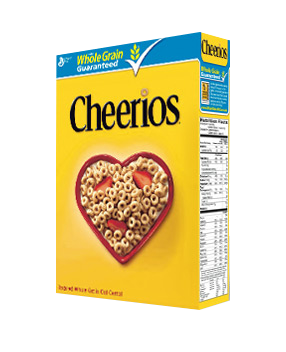 Cheerios are just fine for making Trereal. 1. Put cereal in bowl. 2. Add 1/4 cup of your favorite trail mix, even if it includes chocolate. Especially if it includes chocolate! 3. Add milk (or in my case, almond milk). 4. Enjoy the spectacular deliciousness! 1. Put salad in a bowl. 2. Distribute some tahini (1-2 tablespoons should do it) across the top of the salad. 3. Add your favorite oil and vinegar salad dressing. My husband came up with the name for this one. 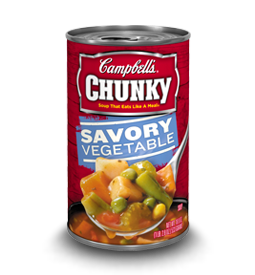 It’s one can of lentil soup, mixed together with one can of vegetable soup. So good that you won’t need to add crackers. Have extra rice in the fridge? Dump it in a frying pan with an egg and whatever vegetables you have on hand (spinach and kale are good). Add ginger powder, maybe some garlic, and soy sauce. And water so your concoction doesn’t stick to the pan. Have extra pasta in the fridge? Do the same thing. If you don’t have soy sauce, garlic, or ginger powder, try melting cheese on top, or adding salsa or tomato sauce. It will be delicious! You’ll feel like a real cook! My ten-year-old invented peanut butter and Nutella sandwiches while visiting her grandparents (I’m sure many other children of all ages have invented them as well). But you can also do pb and honey, pb and sugar (my friend Lara Weeks taught me that one in 2nd or 3rd grade), pb and leftover broccoli (no, my kids won’t eat those, and right now, the broccoli sandwiches are still just a theory for me–they remain to be beta tested…).